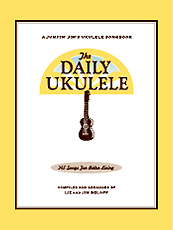 Jim and Liz Beloff's latest book, a 365 tune tome The Daily Ukulele is out. The first 200 copies are signed. Order yours on the Fleamarket Music site. Hey Gary, w bought some books from the Beloffs at the NAMM show last year. They are really nice people. Jim signed them for us. It pays to live in L.A., I guess.